Since hosting my free LIVE webinar titled 12 Things You Didn’t Know You Needed in Your Bug Out Bag, I continue to receive emails asking if the webinar was recorded. The answer is YES – I recorded the Free Webinar and have made it available by clicking the video screenshot below. It’s absolutely FREE to watch and can be played at any time. I will also keep you posted about my upcoming webinar series (that is also FREE) titled The ABCs of BOBs where I cover all of the categories of a Bug Out Bag in detail. At the end of this 4 part webinar series, you will know everything there is to know about Bug Out Bags, what should go in them, how to reduce weight, and so much more. I will be covering the backpack choice, shelter, water, fire, food, first aid, tools and self defense. It will be a fantastic series so stay tuned for more information. Did I mention it’s FREE! Many people also asked for a typed list of the 12 items I covered in the webinar. Below is a list and photo series for reference. Enjoy! The uses for a small metal pry bar are limitless. From digging holes to prying windows and rafters, these have more functions than I could ever list, both in the woods and in the city. The larger one is a Stanley brand and is only a few dollars at a local hardware store and is the one I’ve packed in my personal bag. This is originally designed to convert a faucet to a shower head. However, it has many more survival applications. If you’ve ever tried to fill your canteen (or any bottle) is a public restroom or sink faucet, you know it can be nearly impossible to do. The rubber slip-on gasket on this little unit makes filling from any faucet a breeze. The hose can even to used to fill larger water containers as well. In a Bug Out Bag where space is limited, a sleeping pad is oftentimes a luxury. However, a really decent sleeping pad can be cut from a roll of double reflective insulation. It’s kind of like a heavy duty bubble wrap layered between two emergency blankets. I spent only $20 on a 2 foot x 25 foot roll which will easily make enough sleeping pads for a family of 5. They aren’t going to last forever but for those limited on space and money, this sure makes a great little ground pad. Unless you’re hiking with your Bug Out Bag on a regular basis, I can almost guarantee you’re going to get blisters if you have to hike with it in a disaster for more than about 5 miles. When it comes to blisters, this German made Leukotape is the bomb dot com. If you’ve used band-aids, moleskin or duct tape in the past then you already know they don’t hold up if your feet start to sweat or if they get wet. Leukotape is designed TO STICK TO SKIN and will stay on for weeks – EVEN if your feet sweat or get wet. Simply cover the blister or hot spot with a small piece of cut gauze and then place a piece of tape over it to protect the hot spot area. This is the best blister prevention and treatment tape I’ve ever used. This handy little wrench, available at any big box hardware store, is designed specifically to turn on/off the outside water spigots located on commercial buildings, stores and restaurants. If you’ve ever noticed, these commercial establishments don’t have the easy turn knobs that most residential homes do. This little wrench has 4 different sizes to fit the various spigots out there. I’m certainly not encouraging theft, but I can’t imagine anyone would mind if you filled up your canteen during a disaster scenario. It was a humbling day when I asked my very good friend, who happens to be the most decorated wilderness medic I know, what items should be in a Bug Out First Aid Kit (FAK). Of the 4 he mentioned, I only had 1 of them (a tourniquet). The other three I’m suggesting to you. The SAM Splint is a flexible splint that can effectively splint every bone in the human body. The ACE Wrap bandage is an elastic wrap that helps to put pressure on severe bleeding to help clotting process. The Cravat is a large triangular shaped piece of fabric that has many uses. Among them are a sling and ties for improvised splinting. A great way to save space in your BOB is a packing trick called a Skivvy Roll (watch the video above for a good demo of this). For a 3-Day Bug Out scenario, you’ll only probably need a fresh set of underwear, undershirt and socks. If you lay these out like shown in the photo above and roll them down tight, open ends of the socks can be pulled over each end to make a nice compact little tube. This can even be stored in a zip-lock back to keep it waterproof. A mirror is an absolute necessity for any BOB first aid kit. Especially if by yourself, a mirror helps to deal with issues on the face or in areas you can’t see on yourself (especially eyes). 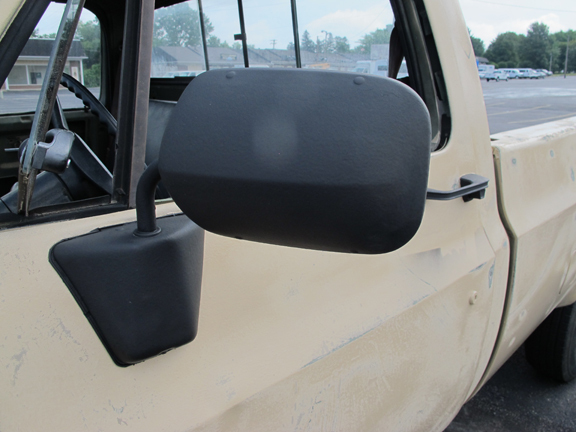 One of these “mechanics mirrors” with an expandable handle gives more flexibility when trying to see on your back, etc, or even around corners, discretely. This tip comes from a friend of mine who recommended it for tick season. When a drop of Tea Tree Oil is placed on an embedded tick, the tick will back away and release by itself rather than you having to clasp it with tweezers and squeeze its guts into your skin. With all of the tick-borne illnesses these days, any help with ticks is a good thing. I purchased these tampons at a health food store (EarthFare) and they are 100% cotton. Before being unwrapped they are about 2″ long and are smaller than a cotton ball. (BE SURE TO WATCH THE DEMO OF THIS SKILL IN MY VIDEO ABOVE) When opened up and frayed apart they are about 15 times the size of a cotton ball. As you can see in the photo, an incredible firestarter can be made by sharpening the end of a wooden match and shoving it into the flat end of the tampon. Then, the entire thing is dipped in wax until completely saturated and coated for waterproofing. When ready to use, simply break away the wax from the match head, fray out the cotton fibers and strike the match. I glued a striking pad on the inside of the tin where I store the fire rockets. These will burn anywhere from 15-30 minutes. They are incredible all weather fire starters. 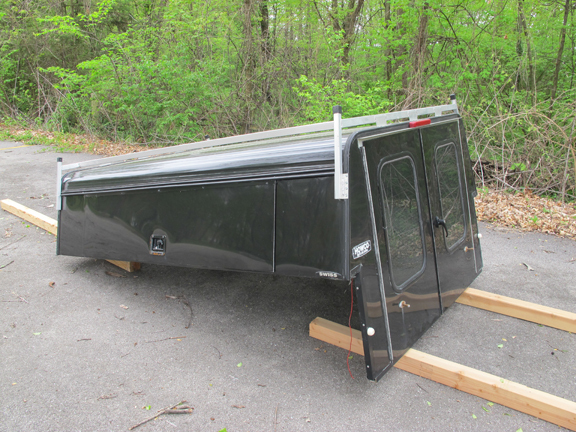 It’s been a few months since my last post about the progress of my new Bug Out Vehicle. Well… I’m happy to announce that it’s finished and I’m really loving it. 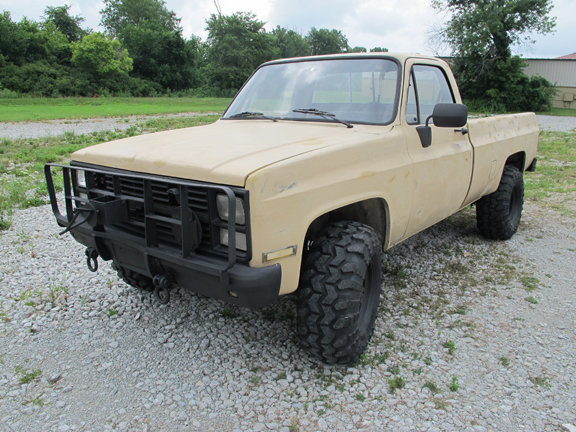 So let’s see a before picture to remind you what it looked like when I first got it. Pictures speak louder than words so below are a few close up shots. 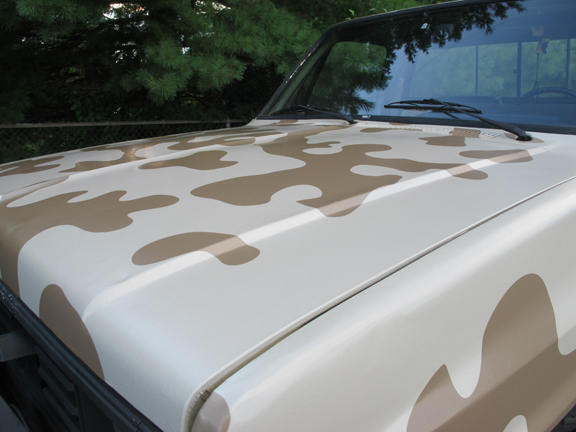 I picked up a camo net from www.camonettingstore.com and it hooks perfectly on the roof rack of the truck cap. 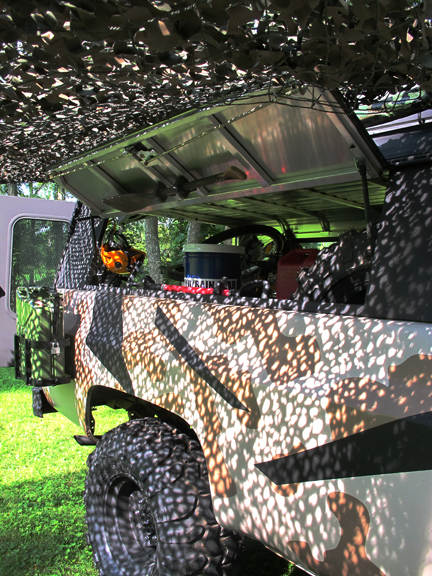 I can rig it up in a variety of ways for shade or for camouflage. 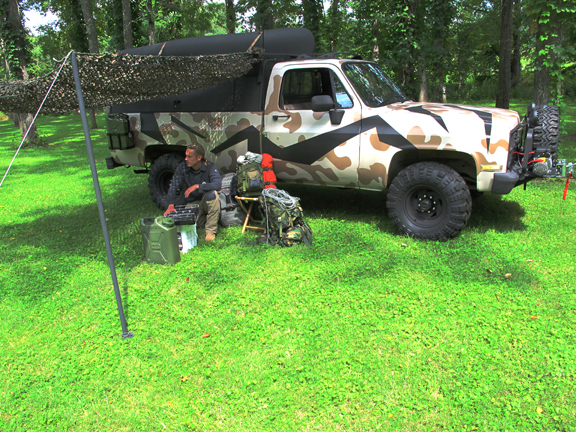 Using PVC piping I also attached a camo tarp that I can roll out and rig up in just a few minutes. 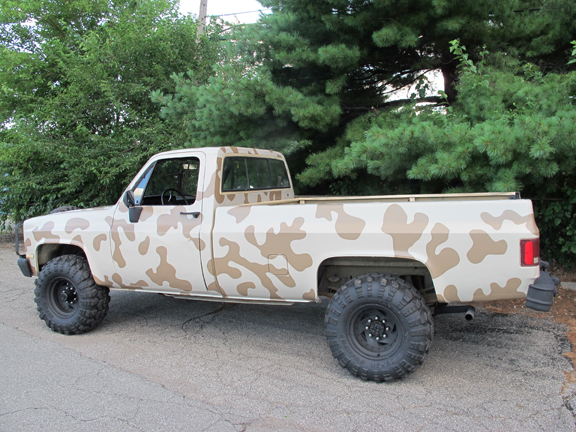 I know… I know… this BOV doesn’t blend in with the crowd. I’ll be the first to admit that I broke the #1 rule of a BOV – BLEND IN WITH THE CROWD. 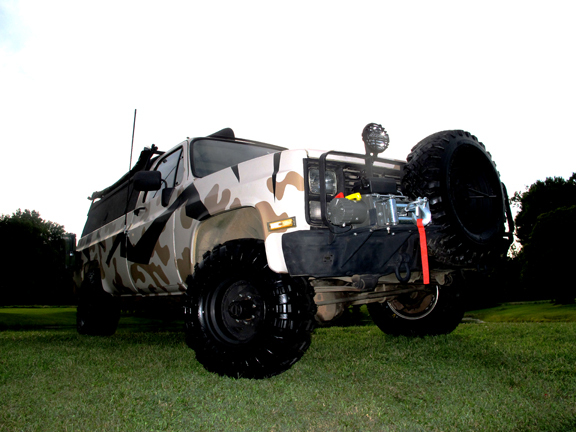 What I haven’t told you yet, though, is that I outfitted this BOV while writing my new book, BUILD THE PERFECT BUG OUT VEHICLE. I couldn’t in good conscious write a book about BOVs and not give you some good eye candy. So, I made a judgement call and tricked it out a bit more than necessary because everyone likes looking at cool pictures, including me. Like my Mom used to say – it doesn’t matter what she looks like on the outside. It’s the inside that counts. This is REALLY true with a BOV. 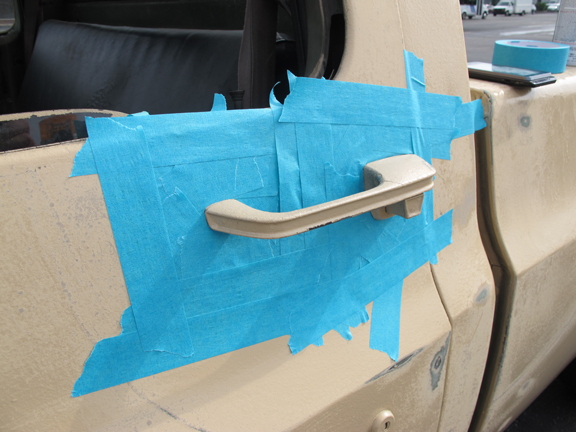 The outside can look like crap – it’s what’s inside that is important. It’s critical that the engine and other mechanical parts are reliable and trustworthy. 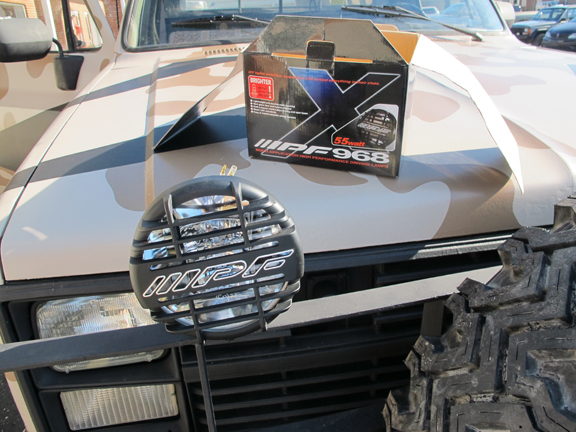 The survival supplies you pack inside are quantum leaps more important that the paint job or bumpers. 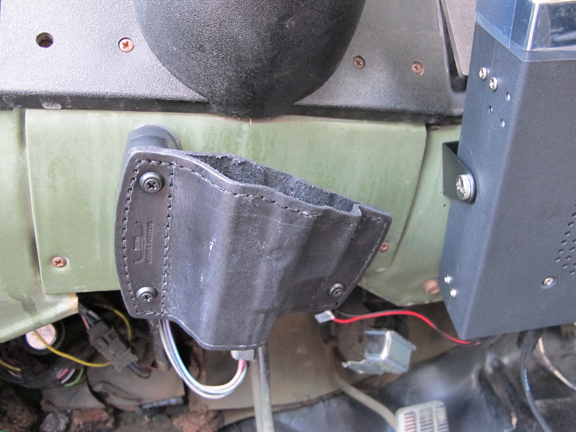 How you outfit your BOV on the inside is what matters most. Here’s a sneak peak into the back of my BOV. There way more to discuss about outfitting BOVs than I could ever do in an on-line post. For those of you who read my first book, Build the Perfect Bug Out Bag, this book is in that same vein. It is an A-Z manual about choosing and outfitting the perfect BOV. I leave no stone unturned. 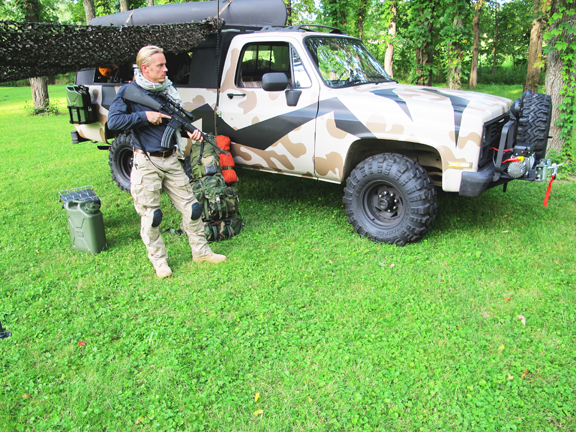 Not only do I discuss different categories and types of BOVs but I walk through everything that you should and shouldn’t consider when outfitting it with maintenance supplies, survival tools, weapons, water, food, etc. 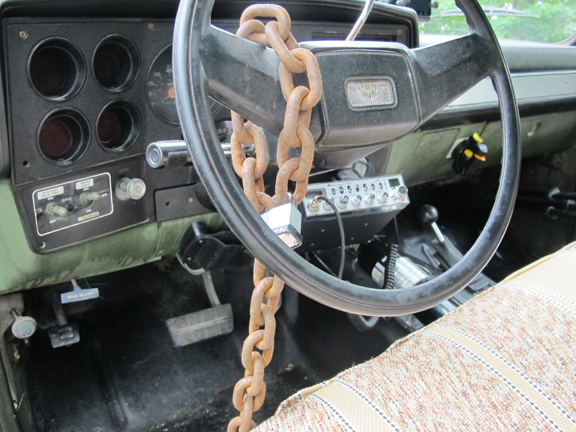 I cover storage ideas and creative ways to work with ‘the vehicle you have right now’. Then I’m sure you’ll enjoy this book. It’s been many months in the making and took a ton of effort as you can imagine. I learned a lot along the way as well and share many of those ups and downs. It seems learning is more about trial and error than anything. A short run of Build the Perfect Bug Out Vehicle is now available on Amazon and I have limited signed copies available at our NOT IF BUT WHEN store. Below are the links if you’re interested in ordering it. As always – thanks so much for all of your support. 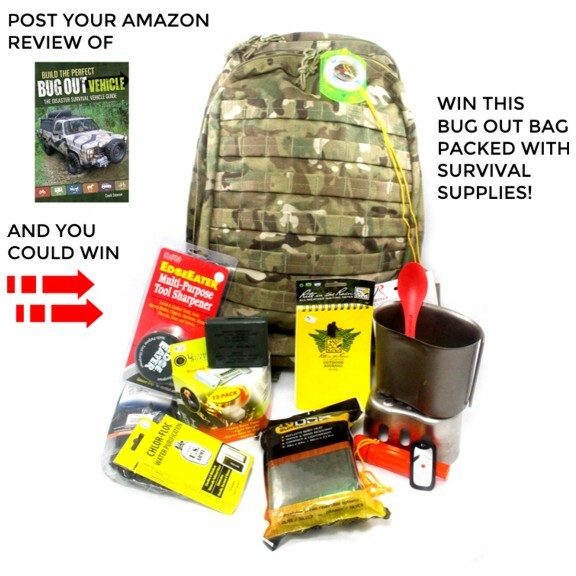 That’s right, just by sharing your AMAZON book review of BUILD THE PERFECT BUG OUT VEHICLE you could win this pack! Below are the details – GOOD LUCK! All of the comments will be gathered and one random winner will be chosen and contacted via private message to get their mailing address. Winner will be chosen on July 28th, 2014 – CREEK’S BIRTHDAY! Is it time for BOB to go on a diet??? 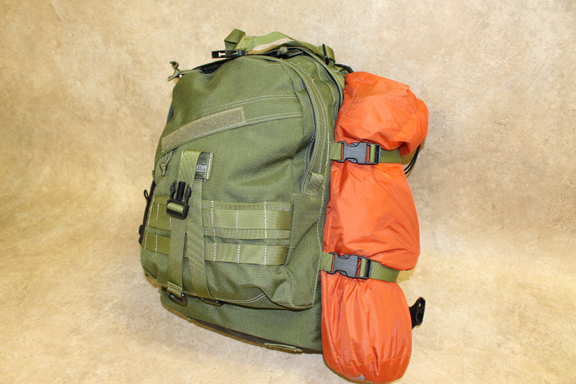 One very popular question I get is about Bug Out Bag weight. Unfortunately, it’s never that there is TOO MUCH space left over in the pack. 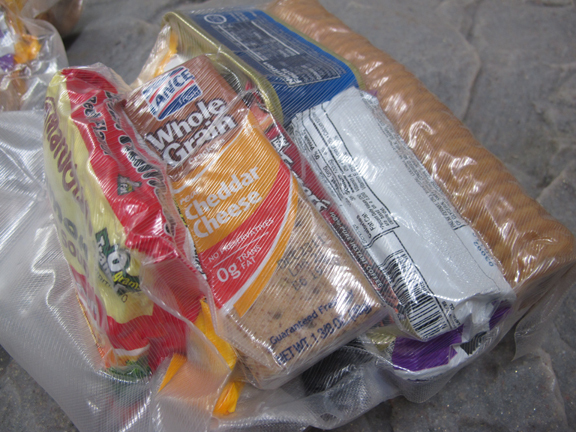 I’m always ask for ideas about how to reduce pack weight and eliminate unnecessary items. Below are 6 tips I’ve come up with for cutting weight from your BOB. Hopefully, one will work for you or at least help you brainstorm a creative solution. I’ve found that when you’re really getting serious about cutting Bug Out Bag weight then you must go through your pack one item at a time. You can’t just look at your pack from across the room and hope to come up with weight saving ideas. This needs to be a methodical and strategic process that involves deliberate thought and consideration about every single piece of kit in your BOB. This is a perfect process for a rainy Sunday afternoon. By this, I mean cut out everything that has to do with food except for 6 high calorie energy bars (I pack CLIF bars). The average human can survive for 3 weeks without food and still have no ill effects to the body. In fact, I read one time that the record human fast was 1 year. That makes eating less during a 72 hour Bug Out seem more than possible! I’m not suggesting not to eat at all during a Bug Out, I’m simply suggesting to cut out all the food related items that you don’t need and only pack high calorie energy bars. Things to remove include stoves, fuel canisters/tabs, pots, pans, silverware, spices – EVERYTHING related to cooking and eating food. 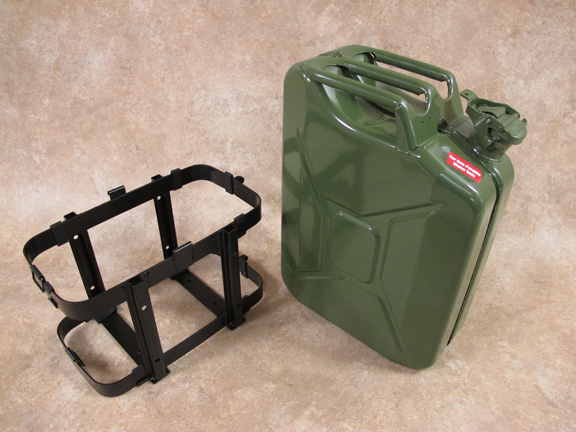 This stuff is bulky, heavy and at the end of the day, unnecessary for a 72-hour Bug Out. DATREX Rations are another compact calorie dense food option. Let’s face it, sleeping bags are one of the bulkiest and heaviest items in our BOBs. I’ve long experimented with ways to reduce weight and bulk in the sleeping department. One solution I’ve discovered is to go with a lighter and smaller higher degree bag. Some of the new 50 degree rated bags are only $30-$60 and pack down to about the size of a small melon. This alone isn’t sufficient for cold weather Bug Outs. A way to add about 20 degrees to a bag like this and drop it to a 30 degree bag is to combine it with a reflective emergency bivvy like the SOL Emergency Bivvy (combo seen above). It’s certainly not as comfortable as a nice fluffy ZERO degree bag but it sure weighs a lot less and takes up a lot less space if you need to drop weight in your BOB. You’ll probably notice some condensation in the bivvy but a couple shakes and a few minutes in open air and it dries out quick. Use titanium where possible; pots, pans, mugs, bottles, stoves, utensils, tent stakes. It’s expensive but it’s as light as it gets. Drill holes in stuff. Anything that you can drill a hole in without affecting function will cut weight. Along these same lines, try to stay true to the Bug Out timeline of 72-hours. Try to only pack what you need for that specific timeline. If you’ve tossed in a roll of dental floss, consider measuring out what you need for three days instead. Same goes for soap, deodorant, etc. You may be able to cut down the portions for several items in your pack. This will certainly reduce weight. Extra clothing is a luxury, not a necessity. From a hygiene standpoint you should only be concerned about an extra set of underwear, socks and t-shirt. Consider the clothes you’re wearing when you leave the house to be your only set (so dress in weather appropriate clothing BEFORE evacuating). Then, for the sake of hygiene, pack only one SKIVVY ROLL. A military friend of mine introduced me to the phrase SKIVVY ROLL. It’s a way of neatly folding your socks, underwear and t-shirt into a nice compact bundle. Folded this way, these items are easy to pack and easy to find and pack down into a surprising small little bundle. Below is a photo tutorial about how to make a SKIVVY ROLL. I personally pack a lightweight backpacking tent in my BOB – actually strapped to the outside as you can see in the photo. However, a tent is a luxury. You can really cut weight if you decide to pack a couple sil-nylon tarps instead. 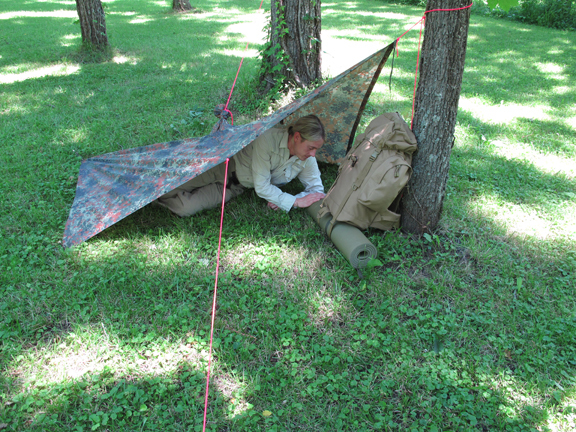 Of course, constructing a tarp shelter certainly takes more skill than assembling a tent. This reduction in pack weight does come with sacrifices. 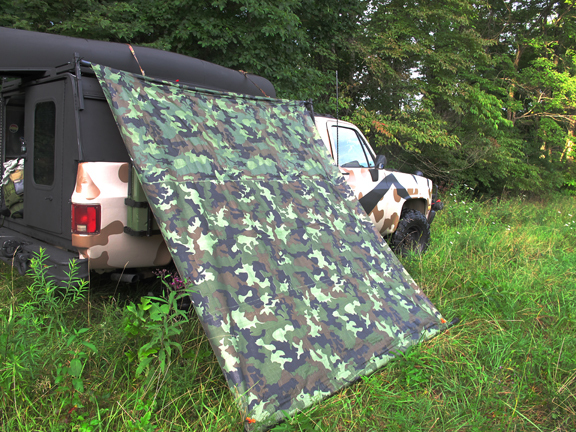 First, tarp shelters are not as good as tents – I don’t care how you set them up. I’ve slept in both many, many times and I’ll always prefer a tent except for the occasional perfect 40 degree fall night in October. 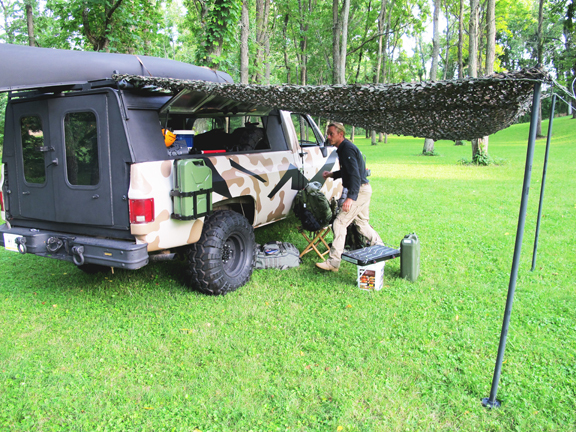 Tarp shelters always have at least one open wall which allows for the entry of a variety of nuisances – moisture, insects, snow, light, smoke, etc. Below is one of my favorite tarp configurations that I call THE WEDGE. 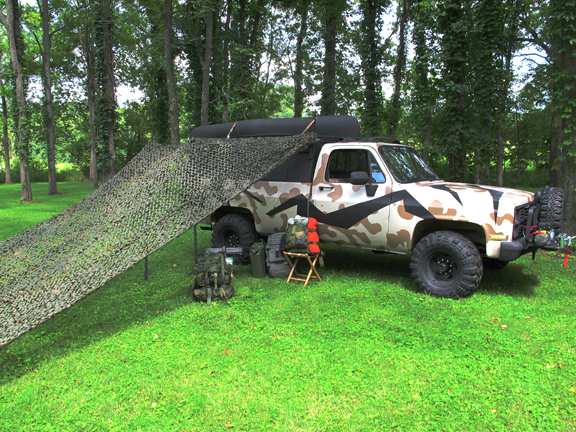 A tarp can be erected this way in under 1 minute and provides excellent protection from the elements. NOTE: Wind direction comes toward the back! You’ve all heard it before: Knowledge weighs nothing. But boy does it takes up time! Some would rather pack the weight than spend the time. 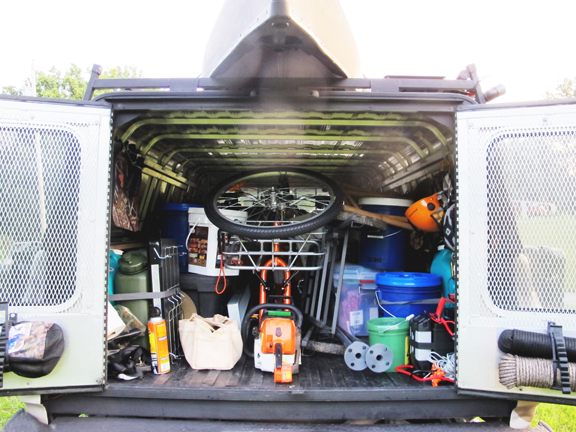 However, the more you learn about shelter, water, fire and food, the less gear you’ll need to pack – period. I’ve long been a fan of redundancy in the CORE FOUR Survival Needs: SHELTER, WATER, FIRE and FOOD. I often recommend that people carry a back up fire starter, or a water filter or emergency shelter in addition to their tent but these redundant items become less necessary as your level of practice and experience increases. Is there an area where you can replace weight with knowledge? What have you guys done to cut weight in your BOB? I’m sure there are some really creative ideas out there that others can learn from and implement as well. Don’t be shy, do tell. 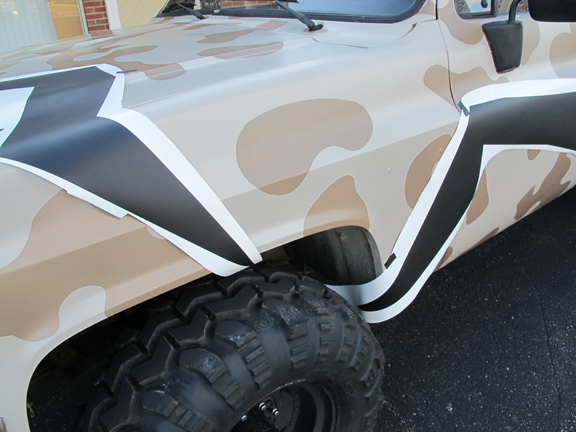 If you remember, in Series Post # 4, I had just wrapped the truck in camo and left you hanging with some modern shaped black designs on a table. Below are 2 pictures for reference. 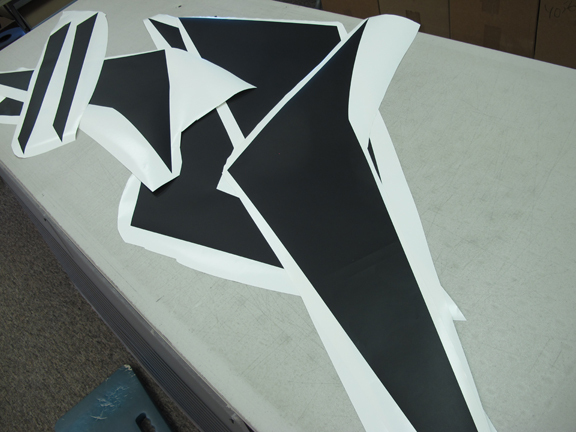 Below is a photo series showing how I used those black designs. 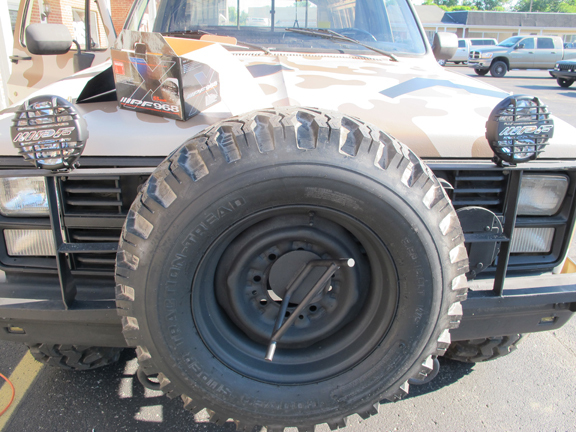 Also, I officially put the bed cap on, added some off-road lights and mounted 2 Jerry Cans to the rear fenders. 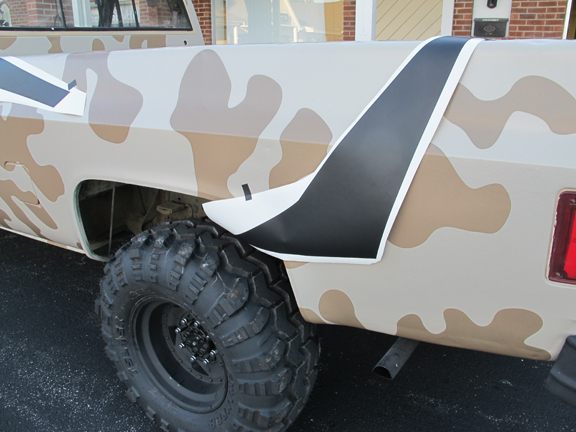 First, I had to tape on the matte black vinyl graphics for placement. Now, time for the official install. 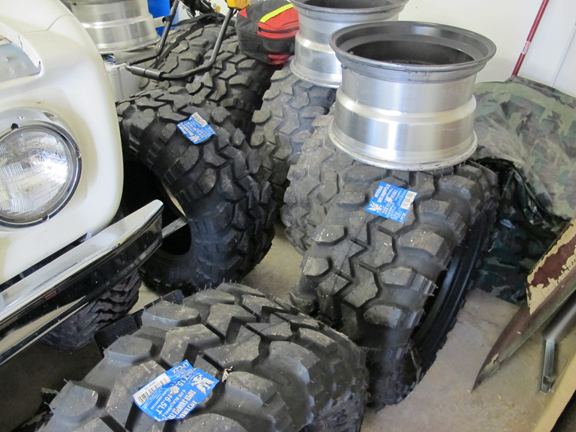 Now, time to add some IPF 968 Series Off Road Lights from http://store.arbusa.com/IPF-968-Series-Light-Kit-968CSG-P3643.aspx and 10 more gallons of fuel storage. Below is the reveal up until this point! Thanks to everyone for their input into this project. Even though I don’t use all the ideas/suggestions I appreciate the comments and advice. All of it is making this a very fun BOV build. If only I didn’t have a budget??!?!?!! As always, thoughts and comments are appreciated. BTW – I have some incredible news to share with you in the coming weeks. I know I haven’t been posting much lately – I swear there is a reason and I also swear it’s worth it. Stay tuned!!!!! Oh yes I did! My apologies in advance to all of you BOV Purists out there – I had to do it. I just couldn’t stop myself. 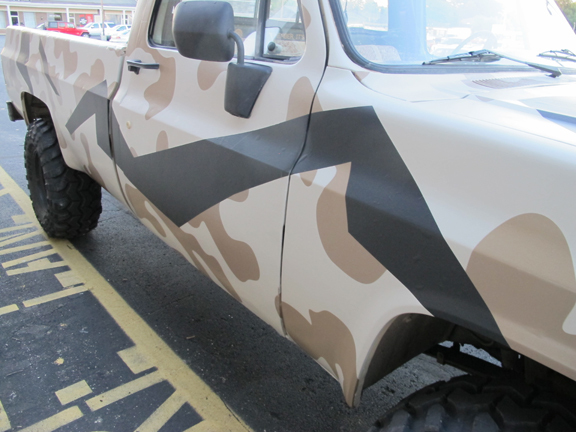 I know, I know… the original bad paint job would have blended better in a crowd of vehicles over the camo. But trust me, this thing isn’t going to blend in after I’m done with it anyway. 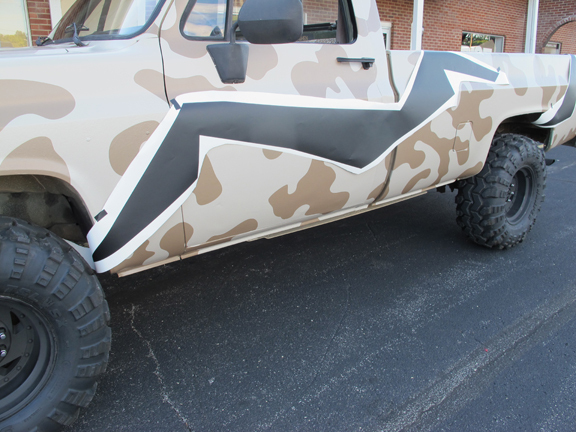 For those of you who need a reminder what the truck looked like prior to this step then here are a few photos below. The first is when I first got it. The second is after a few exterior upgrades. The third is how it looks during this post. Keep in mind that the photos below are still a work in progress. 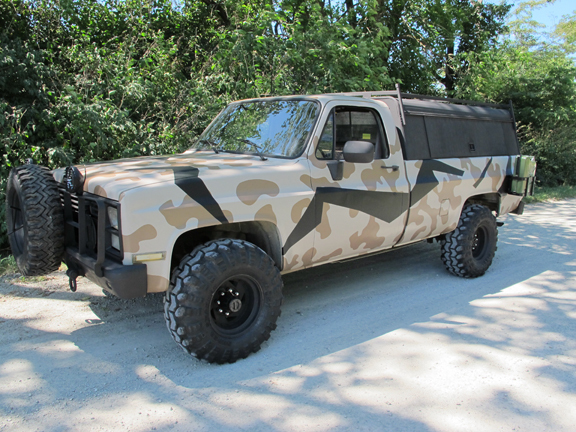 This is not the finished truck by any stretch of the imagination. 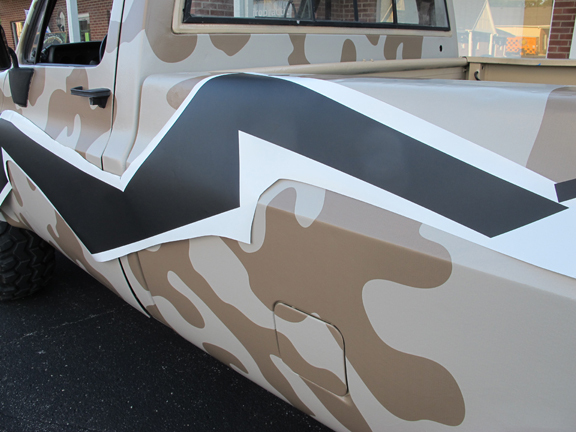 In fact, this new camo pattern isn’t even done yet. There is an entire other layer that goes on next. I’ll give away a hint at the end about that. 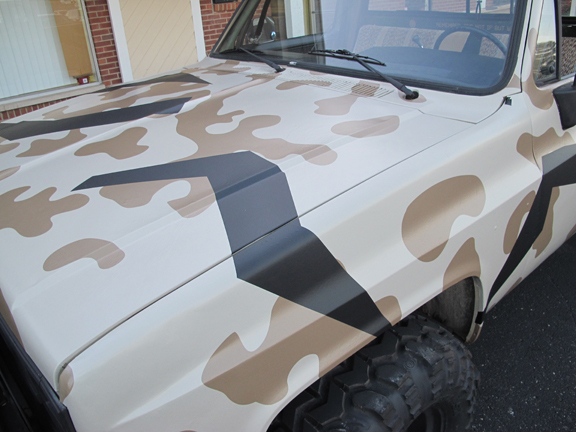 I decided to go with a vinyl wrap for the camo. I paid a little extra for a matte overlaminate to reduce glare. 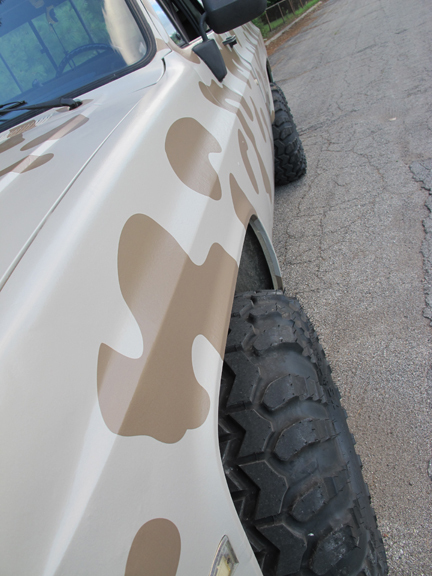 I’ve always liked the desert camo colors so decided to go with a color scheme in this family. I also decided to go with a big chunky pattern. 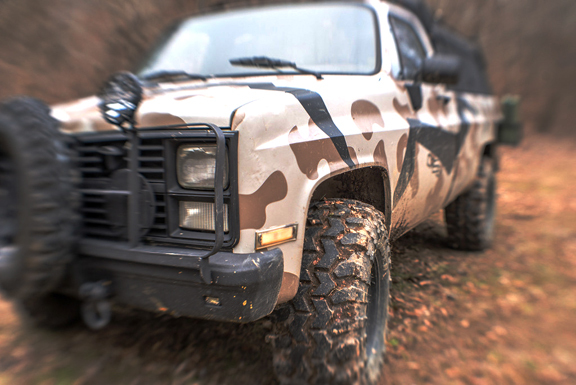 Everything about this truck is big and chunky so the new camo feels right at home. 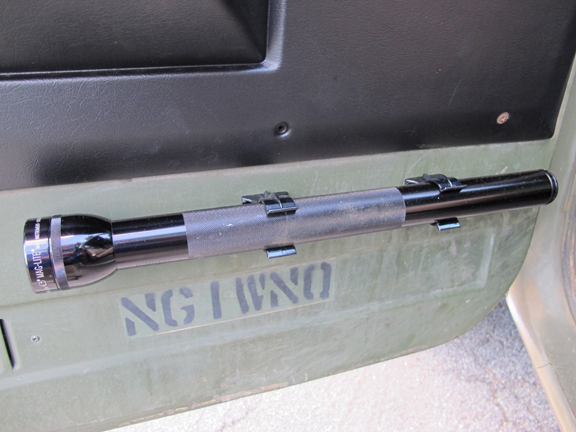 Oh, and I mounted a tire to the Warrior Products spare tire mount. A tire shop down the street had this one laying around and I picked it up for just a few bucks. They were glad to get rid of it. 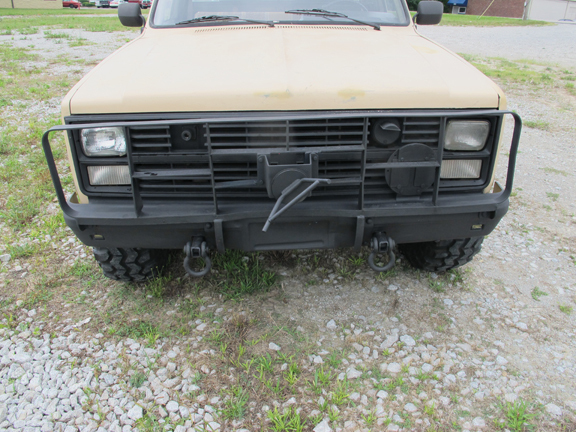 Again, I painted the rim with black grill paint. 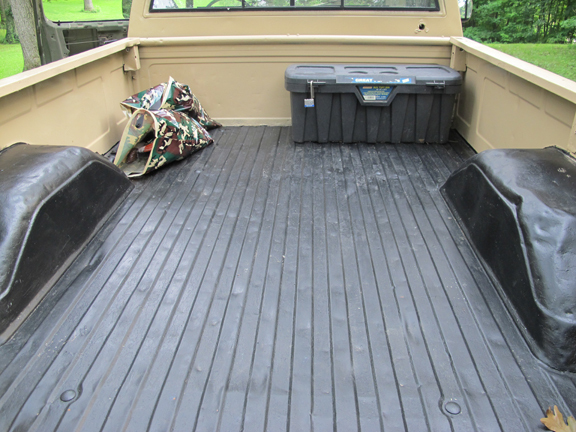 Don’t forget, I still have the matte black bed cap that goes on back. Below are a couple photos to tease the next phase. 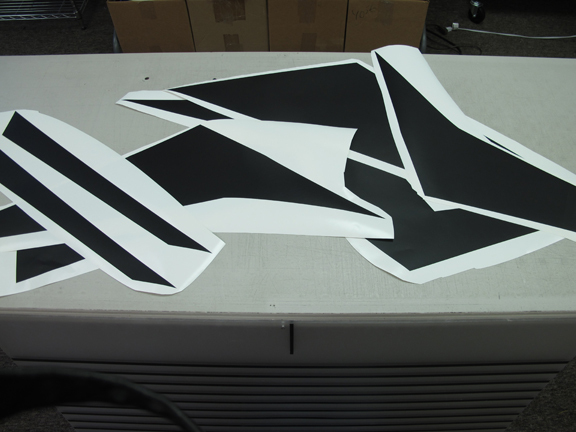 HINT: These are matte black vinyl decals I hand cut myself. Let me know what you think. I’ll keep the updates coming. I wish everyone an amazing New Year. As for me – I better get this thing ready!!! 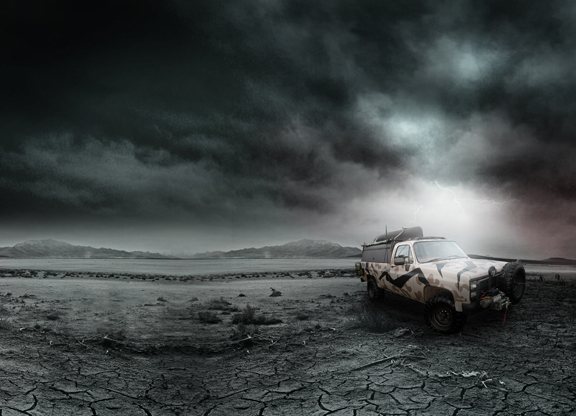 This could be the year of the Great Bug Out. 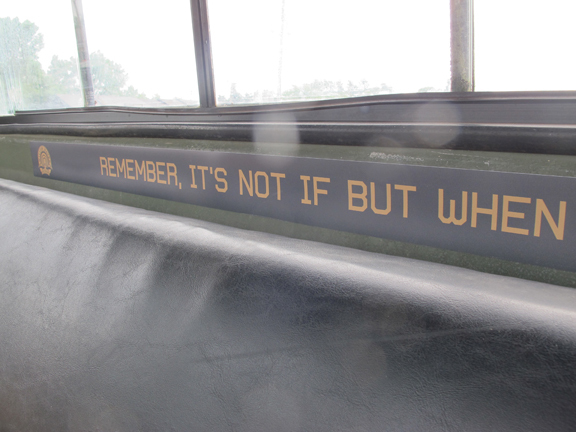 Remember, friends, it’s not IF but WHEN! 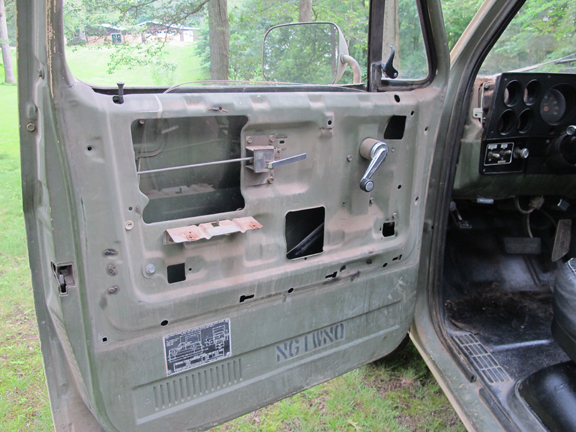 Since my last post I’ve taken some time to do a few interior upgrades to the BOV Truck Project. 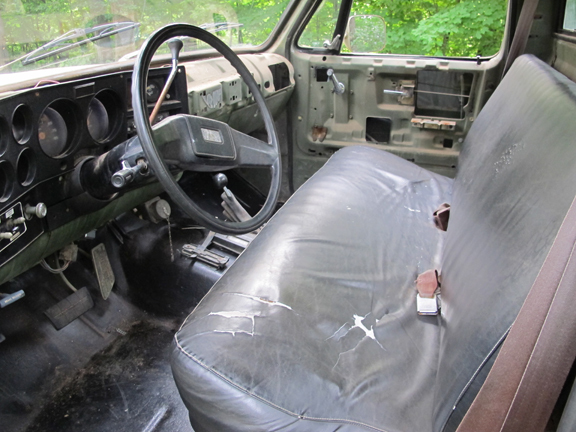 First, let me remind you of what it used to look like with a few interior photos from when I first got the old fella. I’ve always said to choose a BOV that is a very common make/model. This not only helps with parts availability post collapse but certainly helps when making any upgrades or replacements in general – even during times of plenty. 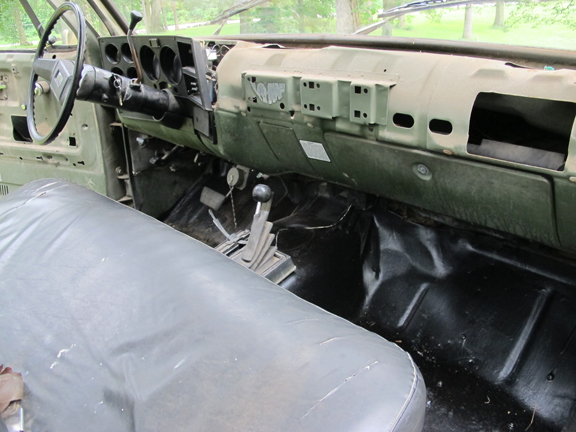 I was able to find replacement door panels and a dash board for reasonable prices. These additions quickly cleaned up the inside. 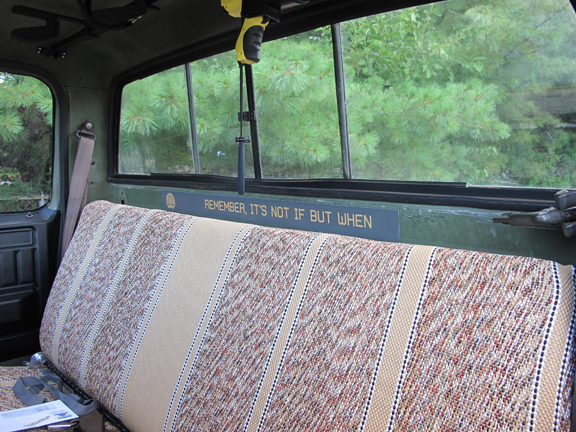 Next, I ordered one of those Blanket Baja Seat Covers to clean up the seat a bit. I think it turned out pretty good. Then, I added a few toys. First, a driver’s side Mag-Lite / Beating Club. Second, I added a few mounts for some firepower. I picked up a custom under dash mount right hand draw holster for my Glock 19 from Texas Custom Holsters. It’s pretty sweet. 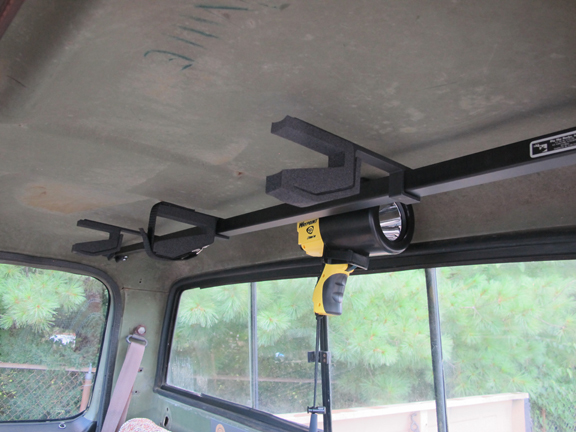 Then, I added an overhead shotgun/AR rack from Big Sky Racks. 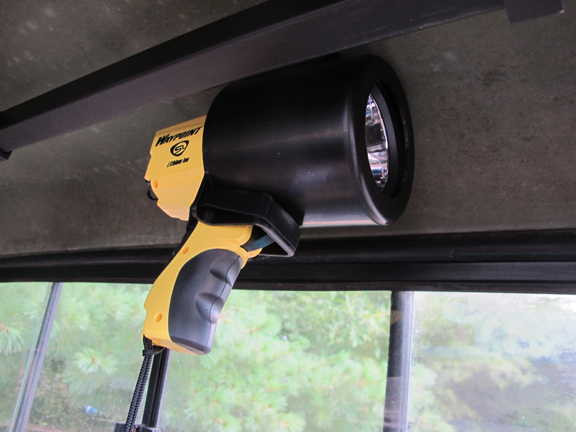 You’ll notice also that I mounted a pistol grip rechargeable spot light. 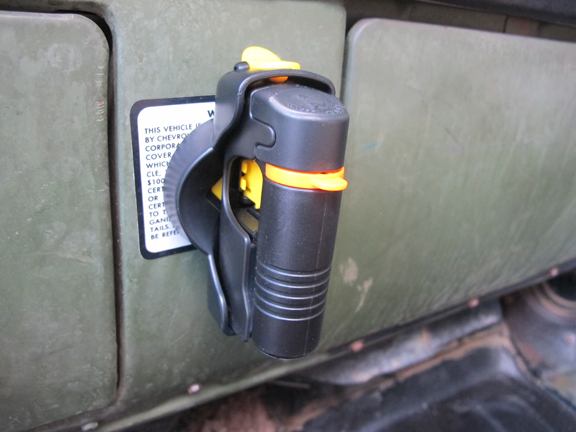 This is from StreamLight and has an infinite number of uses both in and out of a Bug Out Scenario. On the dash I also mounted a canister of Tornado Pepper Spray. It came with a pretty cool thumb release surface mount system. 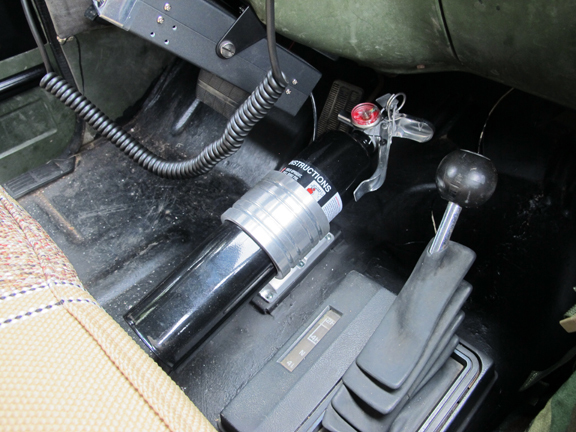 Just below and to the right of the steering wheel I mounted a Midland CB. 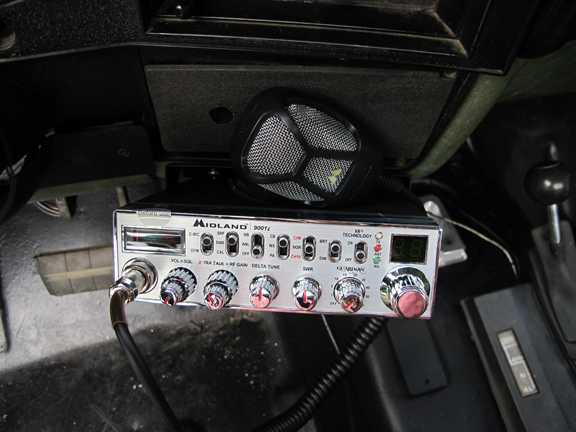 I’m a big CB fan and it’s one communication tool that myself and the others in my Bug Out Convoy will use to keep in touch while in route. 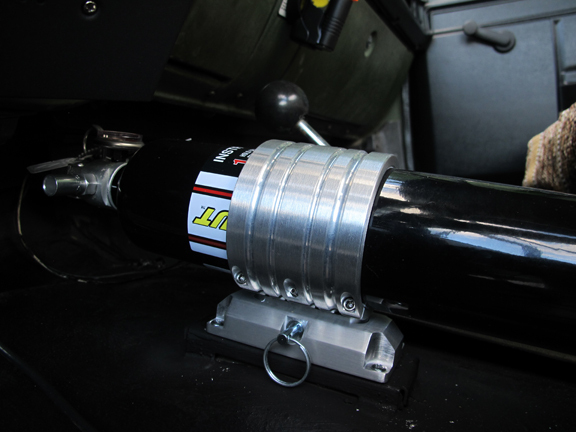 In the center console I mounted a fire extinguisher and custom aluminum billet quick release mount from H3R Performance. 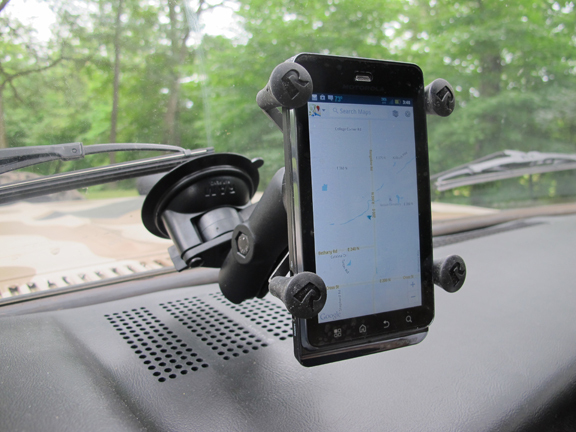 I also picked up an X-Grip cell phone window mount from Ram Mounts. If the cell service works, great. If not, I still have off-line maps loaded that can be used independently of cell and internet connections. If you haven’t considered a Smart Phone App that allows off-line navigation, you may want to think about it. The one I use with my DROID is called CoPilot GPS. It does not require cell or wifi connections and is not Google Maps dependent. 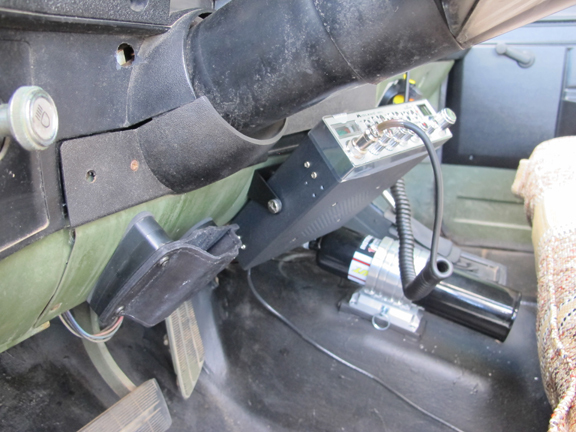 The military used a chain that is bolted to the floor under the driver’s seat to lock the steering wheel to prevent theft. I picked up a pad-lock for that as well. Simple but effective anti-theft tool. 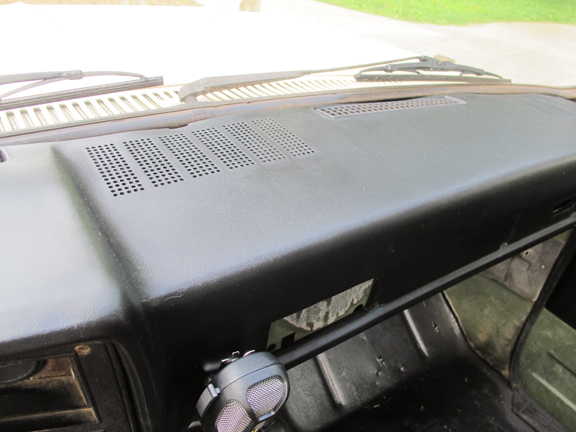 I’ve still got several interior upgrades planned, including dash mount 12V and USB charger ports, but I thought I’d share a quick update of what I’ve done so far. 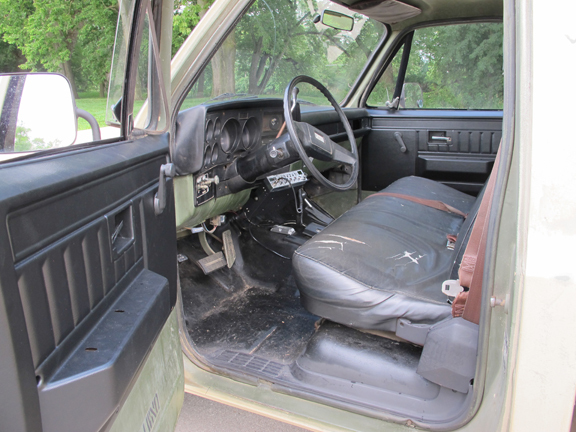 The interior is looking pretty darn good – especially considering what I started with. Be well and Happy Thanksgiving my friends. As always, thoughts and ideas are appreciated. Anyone wondering what I’ve been doing to the BOV???? Well… here’s another update. 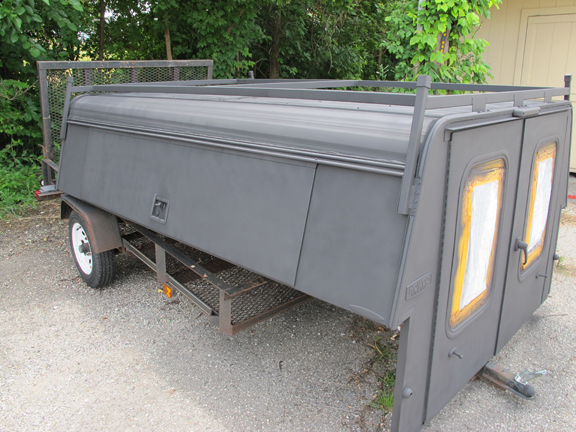 I bought a really nice black aluminum truck cap on craigslist for $200 It’s got locking side doors and locking back barn doors with metal mesh across the inside of the windows. It’s rock solid and it has a nice roof rack which I will put to use later. I plan on adding an extra locking pad-lock latch to each door. I put it on the truck and it fits like a glove. 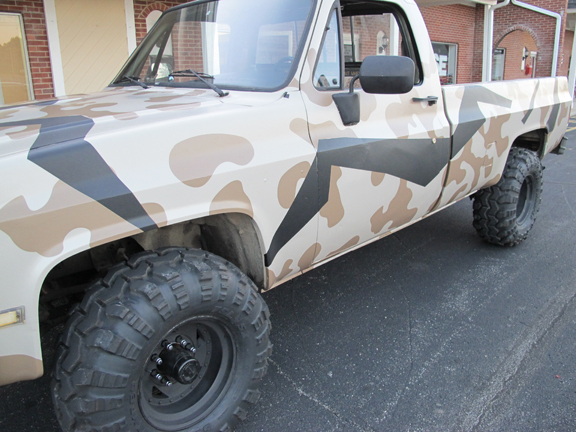 I think the truck looks more beefy with it on so I’m really pleased with the look. I still need to remove the tailgate but that’s an easy fix. I picked up some standard BBQ grill spray paint at the local hardware store and went to work on the cap. I’m not so fond of the glossy black paint on the truck cap. 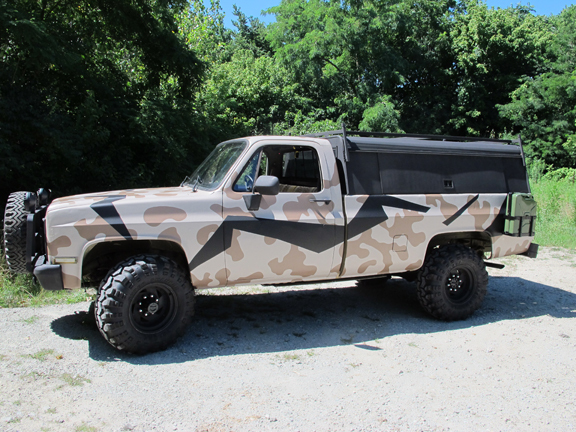 After me and some buddies taped off the windows we had the cap painted in just a few hours. Definitely more BOV style. 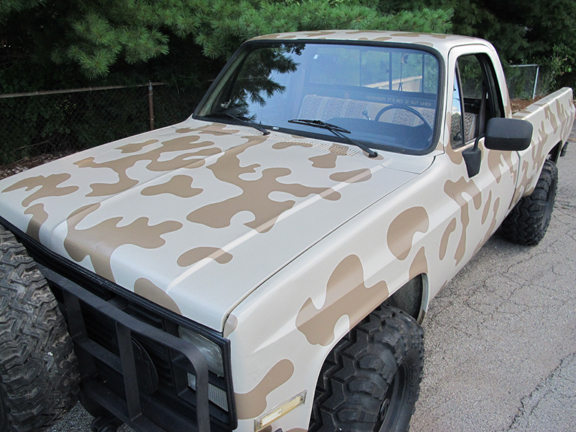 That put me in the mood to do some more spray painting so I decided to touch up all the accents on the truck like the handles, mirrors, bumpers and brush guard. 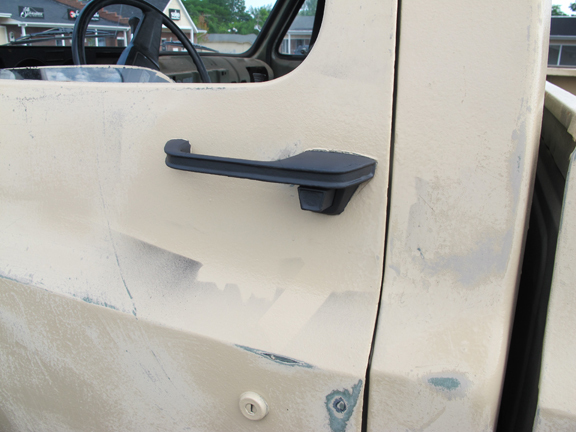 Before I did this I sanded everything down really good and went ahead and sanded down all the crusty spots on the truck paint as well. I’ve got some ideas for this but we’ll get to this in a future post. 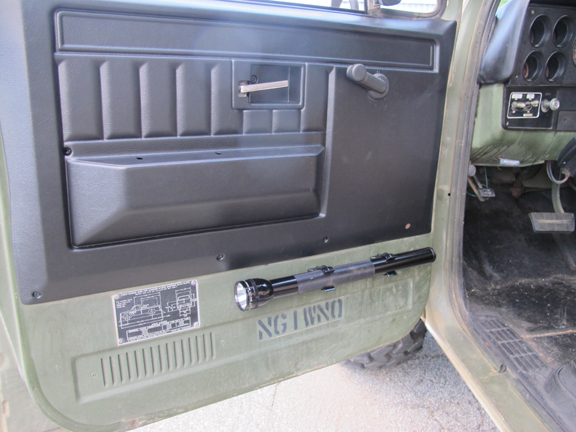 I also welded on a sweet SPARE TIRE mount from my friends over at WARRIOR PRODUCTS. 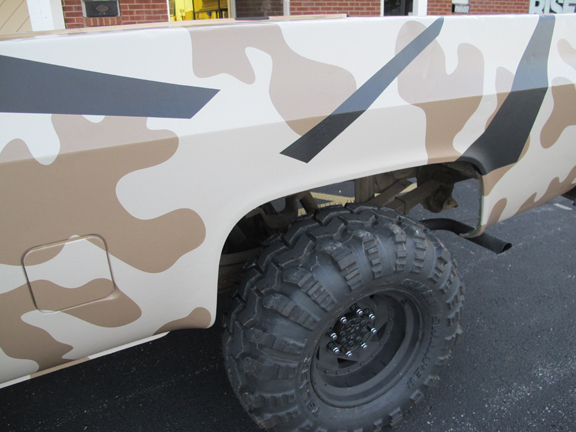 This is the one I chose: http://www.warriorproducts.com/catalog-new/product-category/rack-systems/spare-tire-mount/ I can’t wait to mount a big fat tire on the front of that brush guard. Well, sortof. 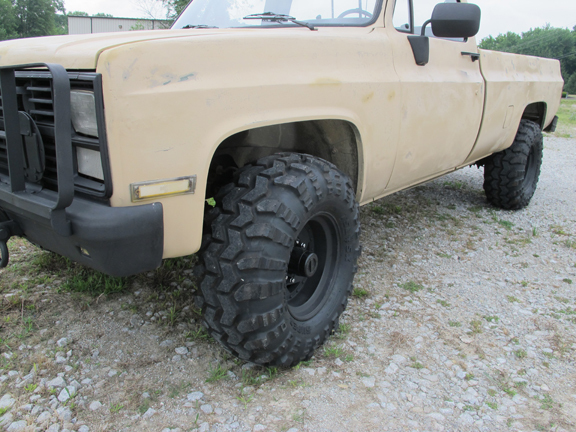 New boots for the truck at least. 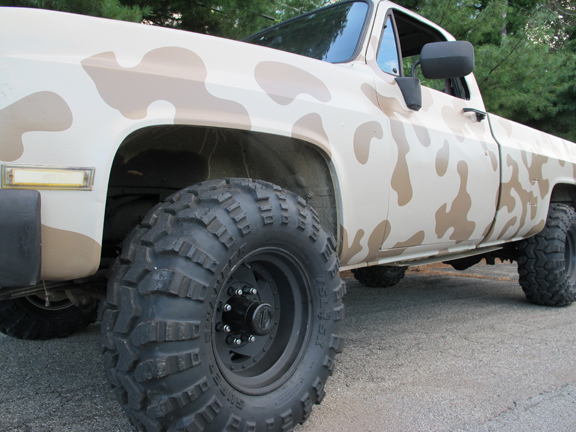 I upgraded the tires to some FREAKING AWESOME Super Swampers from INTERCO TIRE CORPORATION: http://www.intercotire.com/. 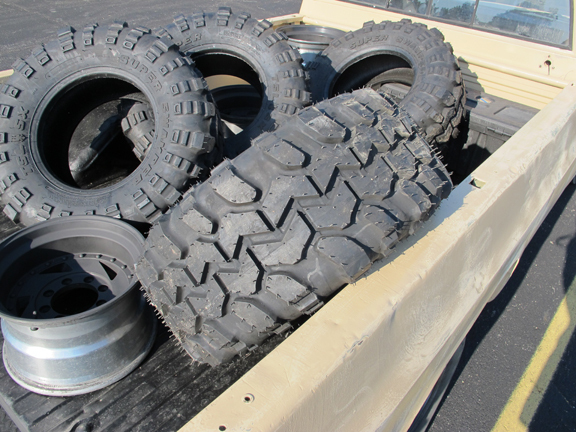 Holy tires Batman – these things are incredible. I picked up some old rims on craigslist and spray painted them with the black grill paint as well. I loaded up the tires and went to the local tire shop as fast as possible. Luckily I got that hernia fixed. So here’s what she looks like so far (without the cap). Definitely coming together. I can’t wait to show you my ideas for the paint. I know… I know… I should leave it alone and blend in. But you know just as well as I do that it would be boring. I’ve got to give you some eye candy so give me a break. As a special touch and to really it make it feel like my BOV, I added a reminder above the seat inside that I thought you’d appreciate. Ok, so tell me your thoughts. 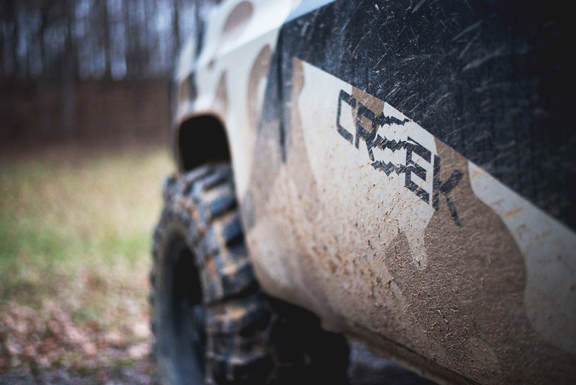 THE WINCH IS COMING – I PROMISE!!! Hello friends. 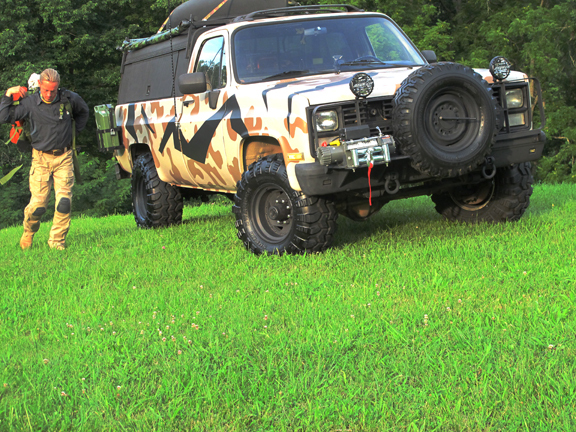 I’ve owned several Bug Out Vehicles over the years. Some have been my daily drivers and others have been a dedicated stand alone vehicle. Some have been new and some have been old. 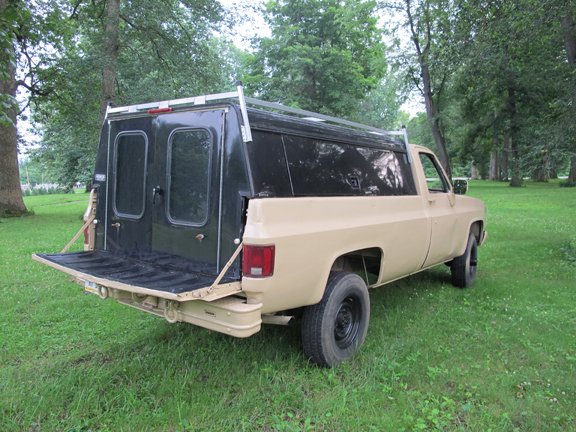 I had a pretty cool 4×4 Ford Cargo Van that I really liked. 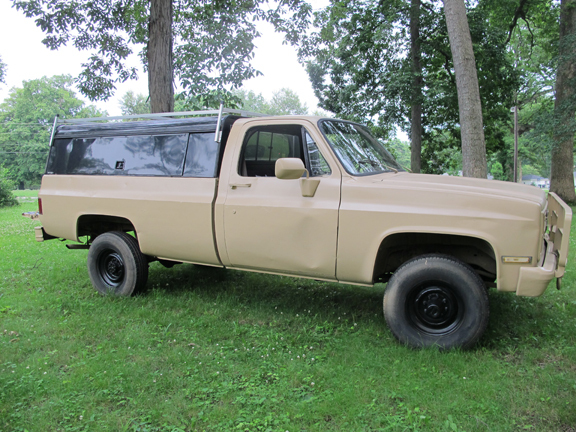 I’ve had a couple old Broncos and I even had a 90s Explorer. I decided a few months ago to take on a special BOV project. I wanted this one to be different. First, I’ve never owned a Diesel and it was about time I got one. Second, I wanted a dedicated BOV that was truly EMP proof so it needed to already have no electronics/computers or it needed to be such that I could eliminate these items without too many compromises. 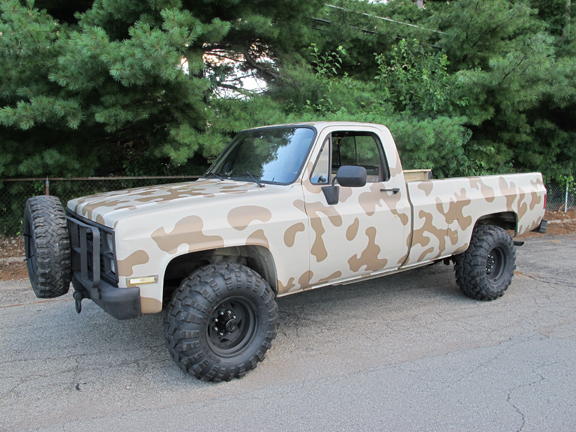 Thirdly, I’ve never owned a military surplus truck and I’ve always wanted one. And lastly, like most of us, I was on a budget. I wanted the biggest bang for my buck. Oh, and I didn’t want too much of a project. I’m not the best mechanic in the world and I didn’t want to get in over my head with too much of a fixer-upper. Tall order, right? After much debate. I decided on a M1028 retired military CUCV (pronounced CUK-VEE). 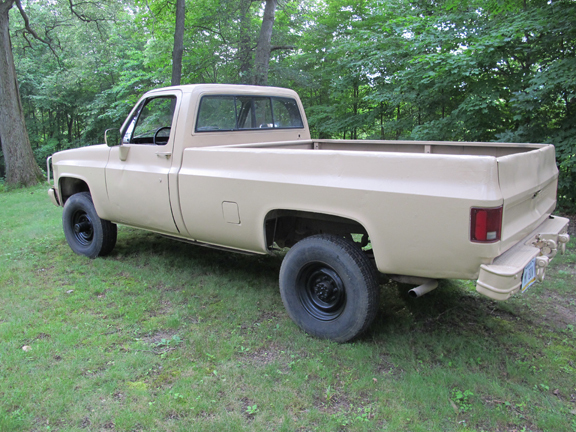 It is a 1985 Chevrolet pick-up truck. 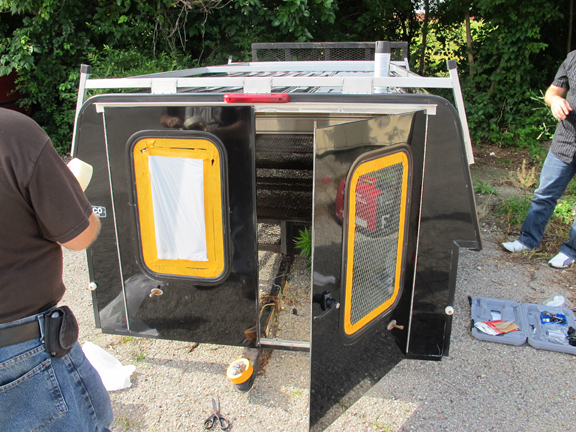 I found it on-line and after a few basic mechanical fixes I’ve got about $5000 into it. Starting with this article, I am going to chronicle my entire build from start to finish of this BOV. It will take months but I thought it would be a cool project to share here on the blog. And, I thought you could help provide input and feedback as well. These posts may at times be very informal – simply an update with my thoughts and/or goals for the project. 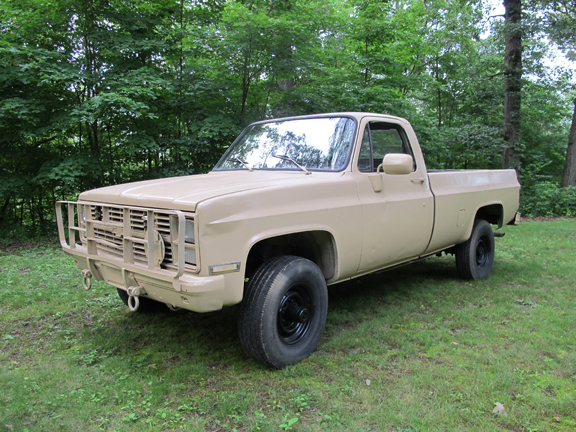 I’ll start with a few pictures of the truck and a little bit of background information. All axles full floating. 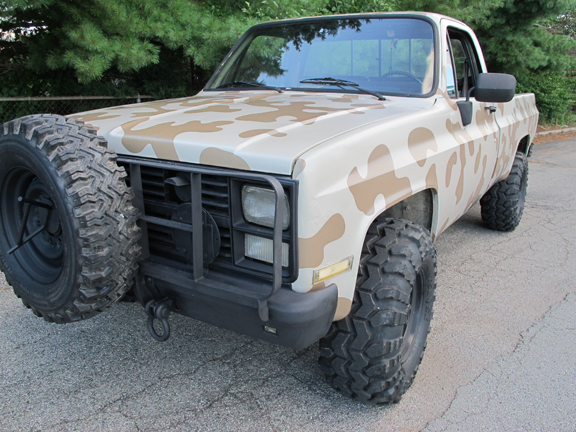 Front axle is Dana 60 with Spicer Trac-lok (limited slip) and locking hubs, ratio: 4.56:1. Rear axle is 10.5 inch Corporate 14 Bolt with “No-spin/Detroit” differential locker. 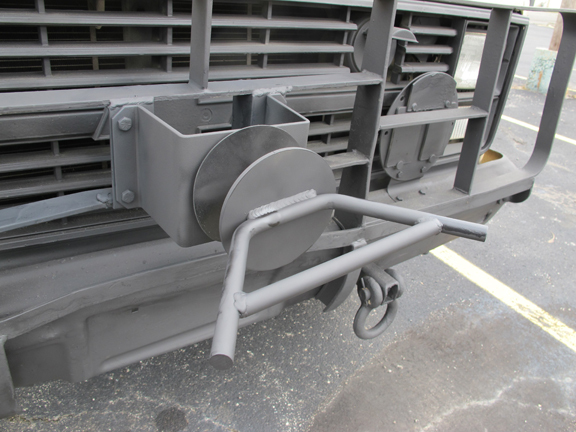 Equipped to tow M101 Series 3/4 ton trailers with maximum towed load of 3100 Ibs. Tongue load not to exceed 300 Ibs. 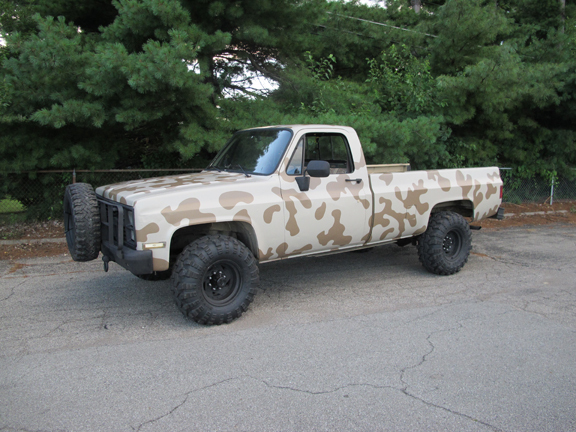 There are many things I like about this truck. Here is a short list – I’m sure I’ll get into more details as the weeks go by. I love the Black-Out Switch. Flip a switch on the dash and all the lights go out – even the brakes. That’s a pretty cool bug out feature! Sometimes you just want to go covert. 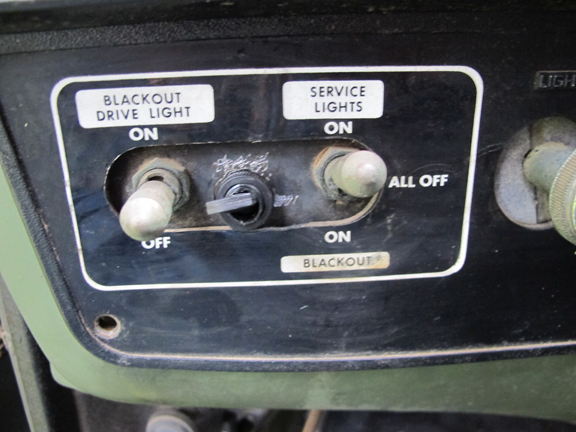 There are no electronic or computer parts on this truck – everything is manual. Minus a few fuses – this thing is theoretically EMP proof as it stands. Gun racks. 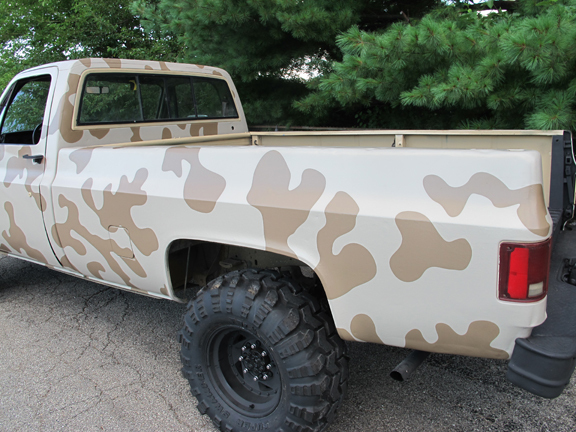 It has 2 vertical gun racks behind the seat – cool. Brush guard. 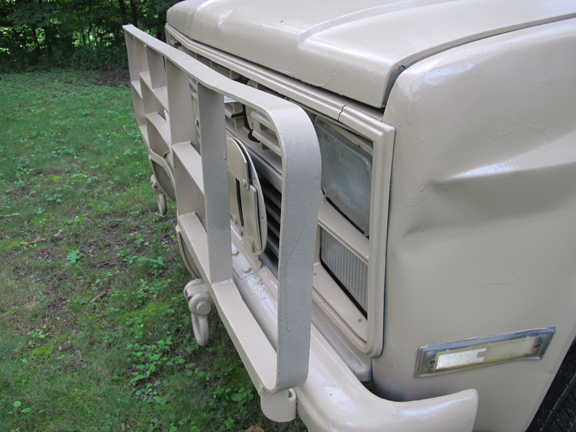 The stock brush guard isn’t fancy, but it sure is functional. I like it. Beefy shackles. It’s got several beefy shackles throughout. It’s diesel. 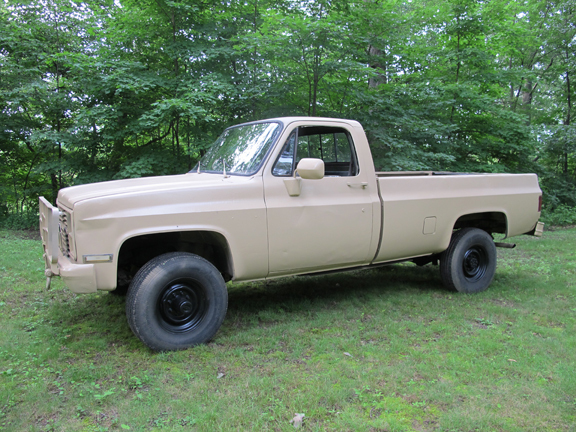 Though this has positives and negatives – I like the fact that I have a diesel truck option. 4×4 w/ detroit locker. 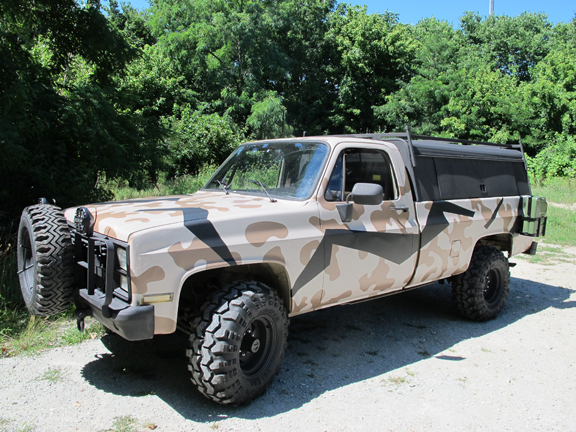 This is a real 4×4 truck. 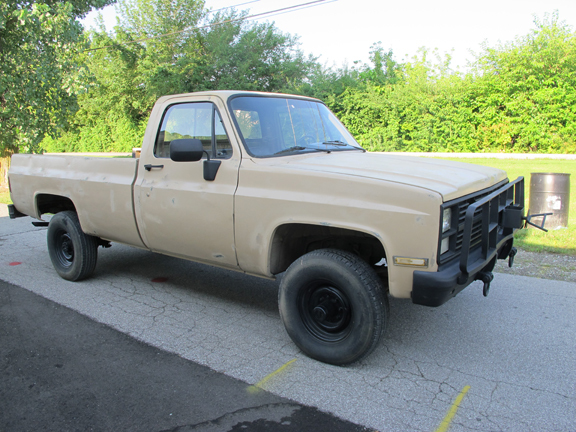 Decent gas mileage – I’m getting over 20 mpg with this truck. No rust hardly at all! The paint is crap. The guy who had it before me painted it with some kind of janky house exterior paint. This is going to take some work. 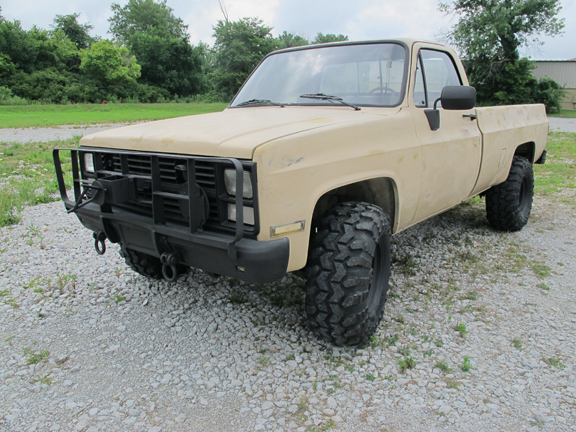 This thing starts groaning like a ticked off grizzly bear when you hit 50 mph. It’s geared for towing, not speed. It’s old. I like that it’s old for EMP sake but I hate that it’s old at the same time. Old is less reliable – period. Install DC power points for chargers, etc. What are your initial thoughts? Any initial ideas for the build? I want to tackle larger tasks at first and handle the details later. I recently received a package in the mail that I thought was worthy of sharing. I’ve got to give credit to Dutch from Texas for this awesome DIY Bug Out Meal idea! When I opened the box I found a couple homemade vacuum sealed food kits. UPS delivers here right before lunch so it was hard for me not to cut them open and gorge myself right then and there. The enclosed letter explained a really cool concept: DIY At Home Bug Out Meals Ready To Eat Kits. As Dutch mentions in his letter, traditional MREs can be very expensive and are jam packed with sodium and preservatives. In addition, one single meal is rather bulky. His solution is to gather meal items and snacks from a local grocery store and vacuum seal them into Full Day Bug Out Meal Kits. BREAKFAST: Qty 2 Kellogs Fiber plus breakfast bars. I also use Instant Oatmeal or Oatmeal Squares. Nescafe Tasters Choice Coffee, or if not a coffee drinker, throw in a tea bag. 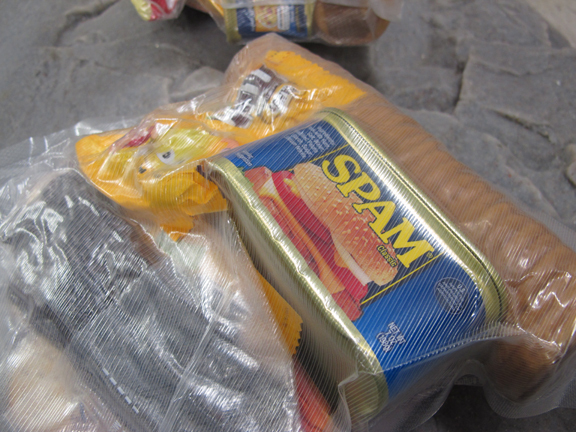 LUNCH: Crackers and SPAM or Kipper-Snacks or a can of Sardines. All of which can be eaten cold and on the march. Rspeberry Lemonade drink mix, just add to a bottle or canteen of water. SNACK: On grueling hikes, you have to keep your blood-sugar levels up, so these have 2 packages of peanut butter crackers and several packs of Peanut M&Ms to be eaten between meals. DINNER: I try to have a least one hot meal a day. I advocate Ramen Noodles. I also pack beef jerkey to break up and add to the soup. *NOTE: The meals he sent me were almost 1 year old and they showed no sign of mold or spoilage. Good sign! 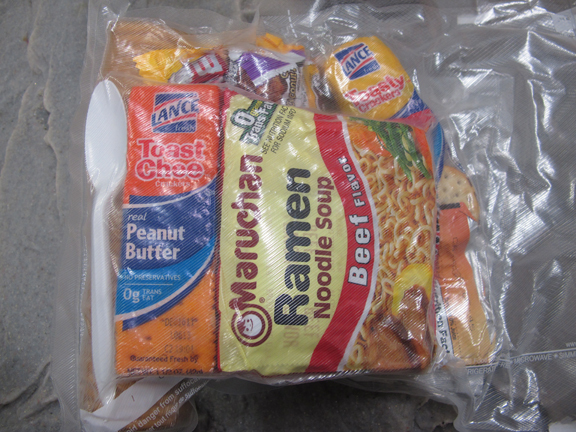 With traditional MREs and camp meals, the selection is fairly limited. And Dutch is right, they are packed full of salt and preservatives. Furthermore, if you’ve ever eaten MREs for very long they’ll back you up worse than traffic during mass exodus. I’ll admit that these are pretty lavish Bug Out Meals but I really like this concept. It allows you a ton of creative freedom when prepping your Bug Out (or BUG IN) emergency meals. You aren’t limited to ‘stock’ entrees and each meal can be tailored to fit specific dietary needs. Gluten Free? No problem – pack non gluten items. Peanut allergy? No problem – your meal kits get plain M&Ms. You get the point. Vacuum sealing the meals not only helps to preserve them longer but also waterproofs them. The added bonus is that they are also organized and very compact – 2 Bug Out Packing essential qualities. Write the expiration date on the outside of the package with a Sharpie Marker (you choose the time frame but I’d be just fine with 1 year). Don’t throw away the meals when they expire. That expiration date marks a much needed camping trip and your meals are now already packed! Does anyone do something similar to this? Is this a Bug Out Meal concept that you will consider? 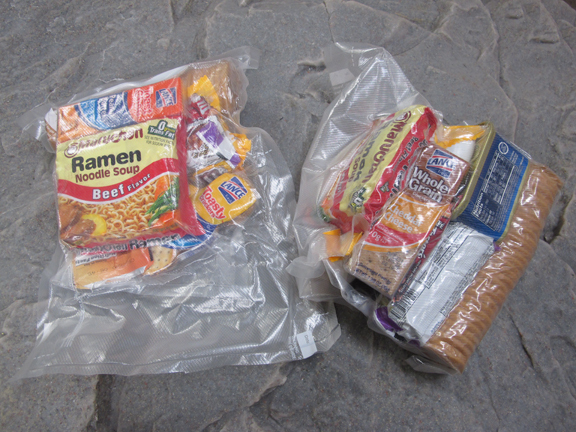 What types of items will your include in your Vacuum Sealed Bug Out Meal? Hurricane Sandy is yet another sober reminder that none of us are exempt from disaster. Sometimes, BUGGING OUT is not the best decision OR possible. In this article I discuss a few thoughts about prepping for a potential Bug In Scenario. Thank you to Brett and Kate McKay for the opportunity.